Every party must have a party leader. The party leader is the character who adds others to their own party. The party leader is assigned by the system as soon as s/he adds the first member to the party. Once you have decided who the party leader will be, s/he can begin adding members. This can be done two ways, either through the party system menu or through a shortcut, by typing (/add). Although the shortcut method is quickest and most used, the system party menu allows messages to be sent to individual party members. ♦ A list of all the members in the party. Each party member has a number in brackets [#] to designate their party number. - To the left of each party member, there is a (tell) button. Left clicking this button will allow you to type a message and send it to that specific party member. - The party leaders manifest will also have a (kick) button next to each character name. 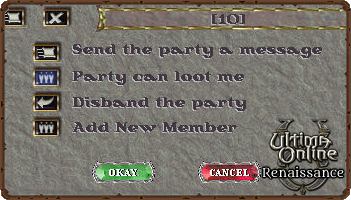 Left clicking this button will remove that party member from the party. Only the party leader will have this button available. ♦ (Send the party a message). or simply type (/) followed by a space and your message. ♦ The second button is a toggle for looting rights. It will toggle between (Party CANNOT loot me) and (Party can loot me). This feature is currently inactive on the Renaissance server as we only have the Felucca map/ruleset. ♦ The third button is different depending whether you are the party leader. The party leaders third button is (Disband the party). By left-clicking this button, the party leader quits the party and the party is disbanded. Other party members will see the (Leave the party) button. Left-clicking this will remove you from the party. ♦ The fourth button (available only in the party leaders manifest) is (Add New Member). Left-clicking this button will bring up a targeting cursor and allow the party leader to add new members to the party. 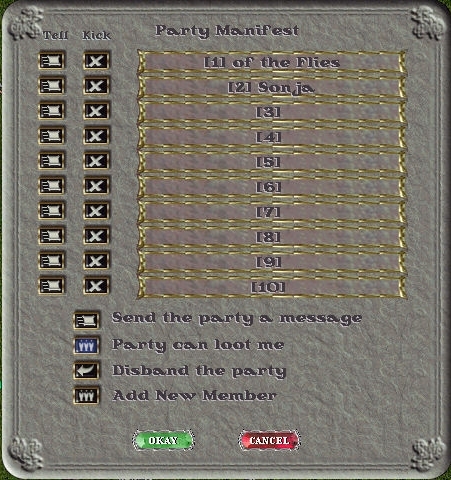 Once the character is targeted a message will appear on the targeted characters screen asking if they wish to join the party. If the character accepts, by typing (/accept), he becomes part of the party. The player may also type (/decline) to decline the offer. Party members will share equally all fame and karma gained from fighting. The Party system on Renaissance does not have any effect on looting, flagging. Anyone can remove anything from a recent kill. However if a party is looting a treasuremap chest players not partied with the chest owner will flag grey when removing an item. The characters health, mana, and stamina. You can use the status bars to target that character as with the current status bars. At any time, any party member may type (/quit) to remove themselves from the party. If the party leader types (/quit) then the party disbands.